Dive into the depths of the hobby! The vast majority of the species discussed here originate from the Great Lakes of the African Rift Valley, namely Lake Tanganyika (around 670 km long and 50 wide), Lake Malawi (around 560 km long and up to 80 wide), and Lake Victoria (around 340 km long and 250 wide). They are members of the family Cichlidae, and share the common feature that the females alone brood the eggs and young in their mouths and sometimes look after the fry for a while after release. The males play no part in the care of the eggs and young. There is no pair bond between the male and female fishes. In the wild all males endeavour to hold a spawning territory. Those that succeed display splendid coloration. Females visit the males and their spawning territories only when they are ready to spawn. It is important to know this in order properly to understand the behaviour of these fishes in the aquarium. There are also mouthbrooders in many rivers and other lakes, but they play only a subordinate role in the aquarium hobby, although some are very important food fishes. 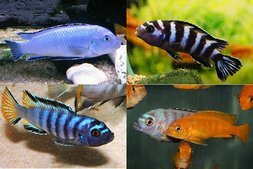 Lake Malawi: Alticorpus, Aristochromis, Aulonocara, Buccochromis, Champsochromis, Cheilochromis, Chilotilapia, Copadichromis, Ctenopharynx, Cynotilapia, Cyrtocara, Dimidiochromis, Eclectochromis, Exochromis, Fossorochromis, Genyochromis, Gephyrochromis, Hemitilapia, Iodotropheus, Labeotropheus, Labidochromis, Lethrinops, Lichnochromis, Melanochromis, Metriaclima (=Maylandia), Mylochromis, Naevochromis, Nimbochromis, Nyassachromis, Otopharynx, Petrotilapia, Placidochromis, Protomelas, Pseudotropheus, Tropheops, Rhamphochromis, Sciaenochromis, Stigmatochromis, Taeniochromis, Taeniolethrinops, Tramitichromis, Trematocranus, Tyrannochromis. 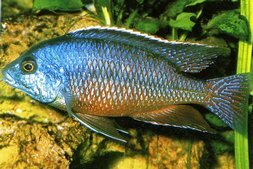 other genera not limited to any particular lake: Astatoreochromis, Astatotilapia, Ctenochromis, Haplochromis, Oreochromis, Pseudocrenilabrus, Serranochromis. There are other genera as well but they are kept and bred only by specialists – if at all – who don’t require educating by the trade. A total of 100-150 species and geographical variants are available in the trade, at least now and then. 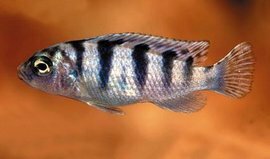 All members of the African mouthbrooding cichlids are fundamentally able to look after themselves and aggressive towards conspecifics. Hence the largest possible aquarium, containing copious hiding-places, is required for problem-free maintenance and breeding. The pH should never drop below 7. 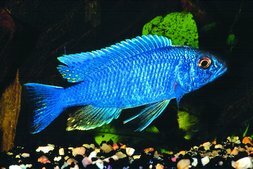 These fishes are very active and have a high metabolic rate, so a large-volume filter with good biological filtration capacity should be provided. The temperature should be in the 24-28 °C range. Hiding-places should be created using rockwork (warning: make sure it can’t be undermined!) as bogwood may cause the pH to drop into the acid range. The substrate is unimportant for rock-dwellers (Metriaclima, Tropheus, Pseudotropheus, Melanochromis, etc), but sand-dwellers (e.g. Cyrtocara) require sandy substrate at least in parts of the aquarium, so that they can sift it for food particles. 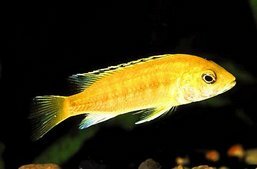 The African mouthbrooding cichlids include species that feed only on Aufwuchs (algae and the micro-organisms living therein) in the wild, as well as piscivores, plankton-feeders, and all possible stages in between. In the aquarium all the standard types of fish foods (dry, frozen, and live) are usually eaten greedily. It is essential to make sure that these fishes don’t become obese. 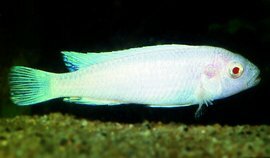 It is particularly important for Aufwuchs-feeders (Tropheus, Metriaclima, Pseudotropheus, Melanochromis, etc.) to receive a low-fat low-protein diet with a high percentage of roughage, as otherwise they may be afflicted with serious, sometimes fatal, digestive problems. Even with very efficient filtration the high metabolic activity of these fishes can lead relatively quickly to a rise in the germ population and the levels of pollutants (nitrate, phosphate), so a partial water change (25-50% of tank volume) should be performed on a regular basis, ideally weekly but fortnightly is acceptable. The temperature of the new water should be as close as possible to the water temperature in the aquarium, although a drop of 2-5 °C (e.g. new water at 20 °C in an aquarium normally maintained at 24-26 °C) is acceptable and may even lead to increased readiness to spawn. The new water should never be warmer than the aquarium water, as the fishes won’t tolerate that very well. 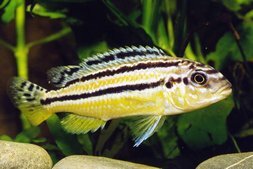 When maintaining an aquarium for African mouthbrooding cichlids it is important to make sure the water is always clear, odourless, and rich in oxygen. The main problem in the maintenance of these fishes is their high level of aggression. If only a few individuals are kept together then it commonly happens that after a while just one dominant individual remains, having killed all the other occupants of the tank. For this reason it is a fundamental rule that the population should be as high as possible, ideally 10-12 individuals of each species. The ratio of the sexes is of less importance, as subordinate males will exhibit female coloration and then be virtually ignored by the dominant individual. 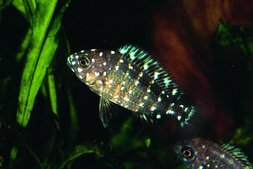 The aquarium for African mouthbrooding cichlids should always be as large as possible in order to provide its occupants with sufficient space to evade the high aggression. 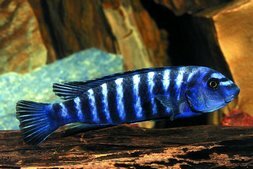 African mouthbrooding cichlids swim close to the substrate and rarely go far from it. A traditionally proportioned aquarium, in which the height and width are around half the length (e.g. 100 x 50 x 50 cm or 120 x 60 x 60 cm) is ideal for the maintenance of these fishes. If possible the aquarium shouldn’t be deeper and/or wider than 70 cm for practical reasons, as otherwise maintenance will be a lot harder. So in the case of a 200 cm long aquarium the dimensions should be 200 x 50 x 50 or 200 x 60 x 60 cm. All species can live for several years in the aquarium. The majority of species become sexually mature at the age of 6-9 months. At this point they will be around half to two thirds of their normal eventual size. The majority of the rock-dwellers grow appreciably larger in the aquarium than in the wild, probably due to the more nutritious diet they receive in captivity. 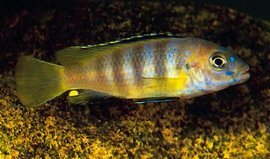 The smallest African mouthbrooding cichlid species is Pseudocrenilabrus multicolor, the Egyptian Mouthbrooder, which usually grows to only 4-6 cm long, while the largest species can easily attain 30-40 cm long. Please check the label on the sales aquarium for the potential eventual size of any fishes that interest you. 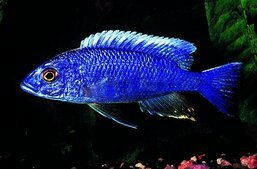 African mouthbrooding cichlids are among the most colourful of all freshwater fishes and are sometimes known as “freshwater coralfishes”. 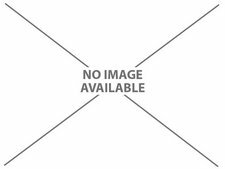 Please use a good book (several are available!) to learn about the numerous interesting peculiarities of these fishes that can’t be detailed here for reasons of space. Schools of armoured catfishes – do they really exist? Will snakeheads be banned in the EU? 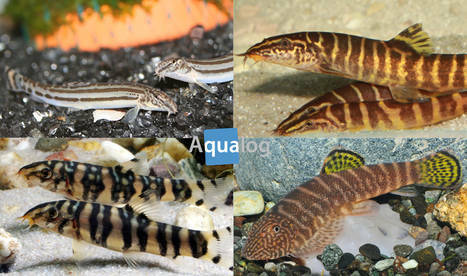 Aqualog.de offers up-to-date information and background reports about aquaristics, terraristics, vivaristics. 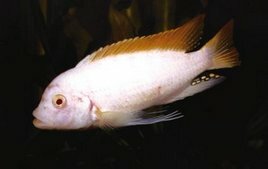 As known from world's famous Aqualog and Terralog reference books, our goal is to offer a photo and information about the care and breeding of every tropical fish. 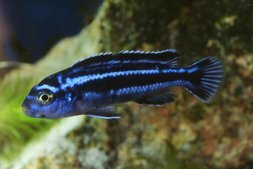 In close co-operation with the highly renown wholesaler Aquarium Glaser, we always extend and update our ornamental fish lexicon with new varietys, rarities und imports. Our blog features many exciting news; natural habitats as well as respective biotope tanks and aquarium plants will be presented. In additon, we cover topics for experts such as biology, technology and how to breed all kind of species.